There are many children’s series that command fearsome allegiance, but the fans are often fickle and the adulation often transient. The Betsy-Tacy books are a phenomenon apart, as they inspire, in some, a lifelong devotion. Many girls discover this series in their early childhood and continue to reread the volumes not only as adolescents but as grown women. Most authors of series assume their readers are frozen in developmental time and hope they don’t grow up between the first and last volumes. Maud Hart Lovelace approached her audience differently, and assumed her readers would mature at about the same pace as her characters. 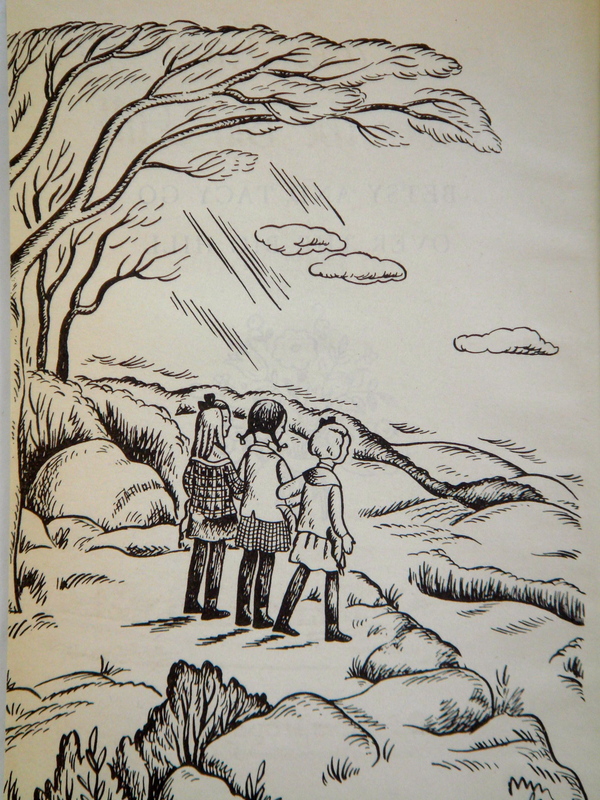 In the first four volumes, Betsy, Tacy, and Tib are five to twelve years old and the writing is pitched accordingly. As the girls become teenagers and then young women, the books are written with an increasingly sophisticated audience in mind. The centenary of the author’s birth saw a Betsy-Tacy convention as well as the launching of a Betsy-Tacy Society and a Maud Hart Lovelace Society. Few children’s book authors have commanded this kind of devoted attention. Maud Hart Lovelace drew liberally from her own life. She grew up in Mankato, Minnesota and her books are an accurate chronicle of turn-of-the-century small town America. 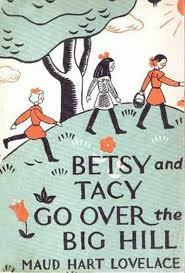 Betsy-Tacy, the first book in the series, introduces us to Betsy and her two neighborhood friends. Betsy is the storyteller, the inventor of activities, the budding author. Tacy is the bashful one with her red ringlets and freckles, one of eleven siblings in an Irish Catholic family. Tib is the diminutive blond who lives in a Germanic household with a front staircase as well as a back, the realist who calls a spade a spade. In simple, straightforward prose, Lovelace chronicles the simple joys and occasional trials of their lives. The pace is that of children. Chapters recount a birthday party of the old-fashioned variety, a picnic up the hill, a piano box playhouse, an imaginary trip to Milwaukee acted out in the buggy shed. Lovelace is attentive to the seasons in the way children are – the soft dust of the road on their bare feet in the summer, the smell of autumn leaves in a bonfire, the milkman delivering from a wagon on runners in the snow. 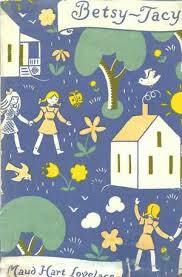 Betsy and Tacy Go Over the Big Hill includes the added richness of a foreign culture set down in rural Minnesota. 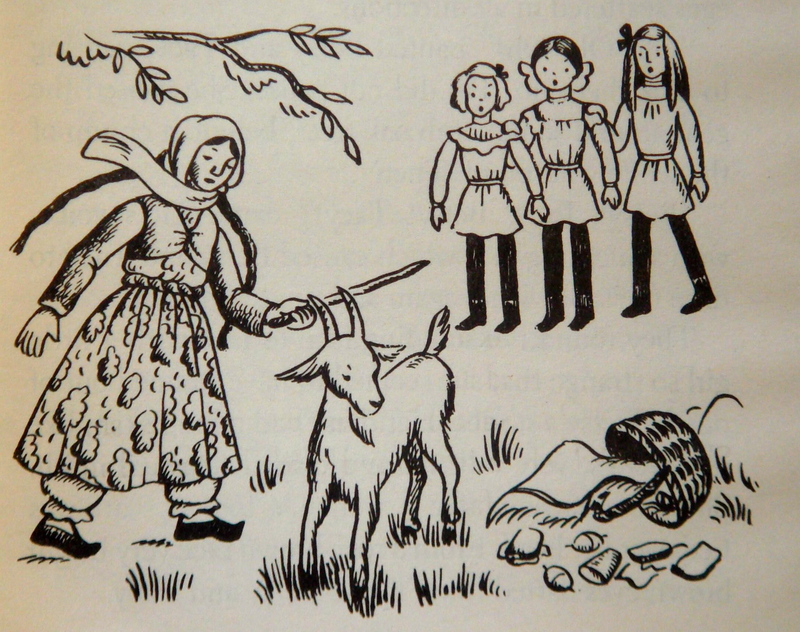 During a picnic, Betsy and her friends happen upon Naifi, a lively Syrian girl who is out herding her goat. With black braids, earrings, a long skirt and longer pantaloons, she could not be more exotic. Her lunch is a chunk of cheese and round flat bread, her grandfather smokes a narghile, her grandmother pounds lamb for kibbee, her father writes Arabic from right to left. She lives in Little Syria, a ramshackle community of unassimilated immigrants who fled their country because of religious persecution. Now in Minnesota, they encounter prejudice of a different kind. 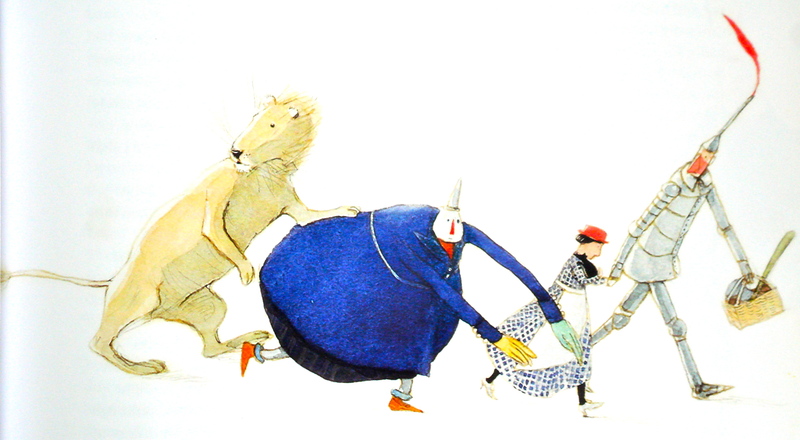 Betsy, Tacy, and Tib come to Naifi’s aid when she is set upon by a nasty mob of boys taunting her with “Dago! Dago!” Lovelace does not belabor this zenophobia, neither does she whitewash it. The first four Betsy-Tacy books were illustrated by Lois Lenski, the creator of the Mister Small books. The black and white line drawings have just the right nostalgic appeal.